Photo Credit: Licensed to Counsilman-Hunsaker. Southern Methodist University (SMU) broke ground in February 2016 on the Robson Lindley Aquatics Center and the Barr-McMillion Natatorium. 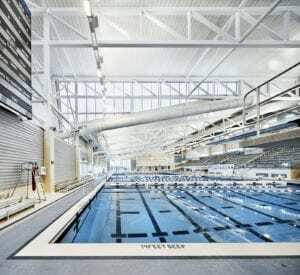 The new aquatics center will replace the historic Perkins Natatorium. The new 43,500 sq. ft. collegiate Georgian-style center will be home to SMU’s internationally recognized men’s and women’s swimming and diving teams. Located on the university’s growing east campus, the center will provide facilities for practice, competition, and community use. 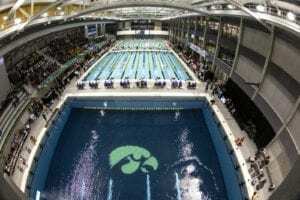 The aquatics center features an eight lane, 50-meter indoor pool with a platform diving well, four springboards, and a 10-meter tower for training and competition. 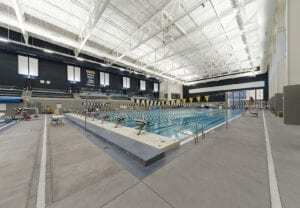 Coaches’ offices, locker rooms, and a classroom / meeting area are located adjacent to the pool. The center will also be available for community use and swimming lessons. 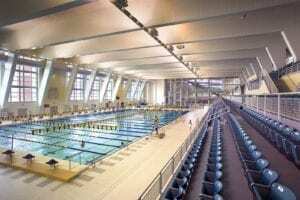 SMU is one of the first universities in the country to install a video system that will automatically upload videos to a cloud management system, allowing athletes and coaches access to analyze divers and swimmers with new coaching technology. Four strategically placed video cameras will give coaches and divers the ability to watch dives from all angles. 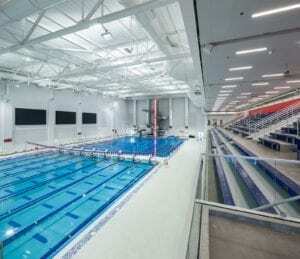 Unique to this facility, the aquatics center will have three videoboards placed opposite of spectator seating. These videoboards will give the spectators full video and updated scores for both diving and swimming.